We have established cliental throughout the Province such as; Adair Morse LLC., Caisse Populaire, CIBC, Bank of Montreal, Scotia Bank, TD - Toronto Dominion Bank, City of London, City of Ottawa, City of Ingersoll, First Nations, Grant Thornton Limited,& Touche LLP, BDO Canada, Lease Link Canada Corp, State Farm Insurance, The Ministry of the Attorney General, and many others. Our solutions can fit any size business; from Corporate And General, small business, individuals and the general public. We are ACCREDITED and LICENCED with the Ministry of Finance and continue to expand our Professional Memberships and Designations. 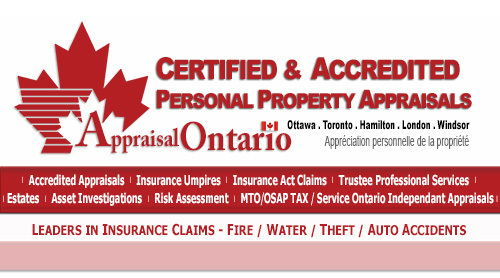 Appraiser Services ONLINE, Saving Money. 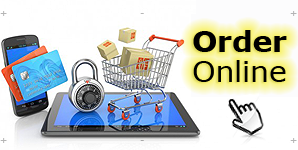 You can now order online and save! It's simple to use and only takes a few minutes to fill out your request online. (plus your delivery options) The options are your's, you can even order a full Insurance Report; Appraisal Certificate and more..
Full On-Site Inspection, Valuation Assignments - We clearly provide FULL DISCLOSURE to our clients. 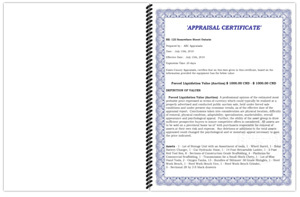 All Appraisal requests are sent in a Written Proposal and are GUARANTEED in writing . This has proven to insure that there is no miss-communication or errors in our client's requests. On acceptance of our proposal(s) we will require the client to sign a statement of account; Appraisal Agreement and our Disclosure Letter. Once we have received the signed documents, we would book the exact time and date of the inspection. We would enter into a Mutual Undertaking Agreement, which would outline our duties, responsibilities and timelines. This agreement would also contain a non disclosure agreement, with conditions for each assignment. We include full disclosure and penalties if we do not full fill our end of the agreement. Before the Appraisal Inspection appointment is booked, we may require up to 50% up front of the fee structure listed in the Appraisal Agreement and or a deposit may be required prior to the time of inspection. 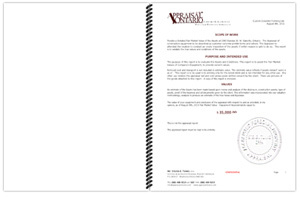 The balance of the assignment is due and payable prior to the Appraisal Report delivery. At the time of delivery of the report, would also include all data; complete market analysis, references to the comparison working sheets, images, provided assets lists and all working notes. 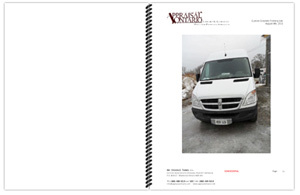 All this information would be the property of the client and we would only retain a finalized copy for our archives. At all times, all information conveyed verbally or in any other form will be the property of the client. We will maintain our Copyright under the previsions of each assignment, not unless stated or agreed upon. 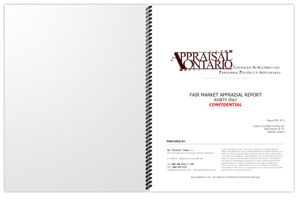 Flat Rate Appraisals are Available - please ask for further details. Every appraisal is unique and a written proposal will outline the actual time and charges per assignment. The appraisal time usually and report depending on the complexity of the item(s) and the requirements for the end appraisal report. 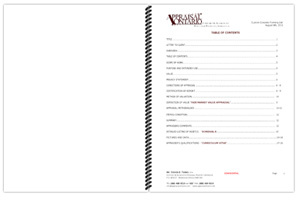 If the assignment is only required to be complied in a PDF format & delivered electronically ONLY. Fees Start at just $195.00 for Desktop Appraisal, plus optional delivery choices. The Appraisal is based on all the information; descriptions, photos etc are disclosed and delivered to the Appraiser to complete the Appraisal. THERE IS NO ON-SITE INSPECTION BY A CERTIFIED APPRAISER. BUT WILL NOT Satisfy Tax - Insurance Apprisal Claims - Court Proceedings. 50+ items. We will provide a written Proposal. An Appraiser's Inspection takes approximate 1- 2 hours, while a Pre-Purchase Inspection may take longer. 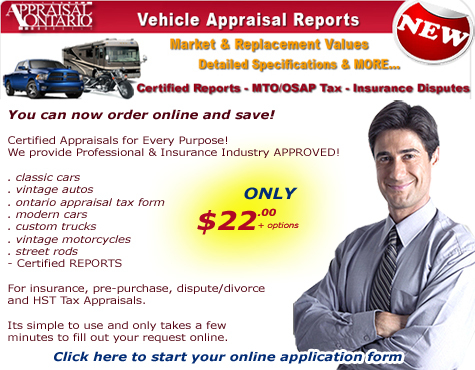 After gathering the required information, and taking digital photographs of your vehicle, the inspection agent will review the information with you, and submit it to our appraisal and publishing departments in order to research the estimated fair market value, and to compile a professionally formatted appraisal, which will be mailed to you in printed form. Payment for all appraisal services is due prior to, or immediately upon completion of the inspection. Appraisals are Mailed via USPS Priority Mail with Delivery Confirmation Unless Otherwise Arranged. 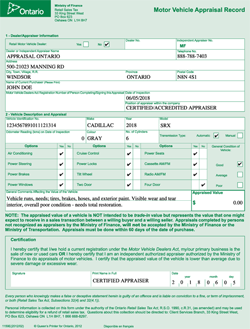 All Inspections, Appraisals and Related Research are Performed by Auto Appraisers and/or by Appraisers Certified by the PPASC Personal Property Appraisal Society of Canada, who have Personally Owned, Repaired and Restored Corvettes and Muscle Cars, Exotic Automobiles, Specialty Vehicles, Collector Cars and Motorcycles. Rush Service, Additional Copies, and CD ROM - DVD - Electronic Versions are Available. WE DO NOT CHARGE a Commission on any of our Appraisals. FREE Consultations & Written Proposals. Everything is in writing - before we begin. WE ARE ONTARIO MINISTRY of FINANCE (OMF) LICENSED & ACCREDITED. We also do estate evaluations and documentation analysis reports, for smaller estates. Fees can be altered to fit in with your needs and budget. We are always happy to discuss our fee structure with you. Conditions of Sale/Contract - Our fees for a complete CONTENT OR ESTATE SALE start much lower than the large Toronto Companies. We start at 5% of the price obtained for all goods sold. There are no costs to you as we simply take an agreed upon percentage from the proceeds of the sale and INCLUDE everything you will need for Probate purposes. Our fees for JUNK REMOVAL start from as low as $375. When comparing our prices to any of the leading junk removal companies, we typically charge 25% less than their price. Contact us for specifics, or to book a free consultation. More Cash, Less Hassle ...Relax, We'll Handle Everything! In most cases, fees are much lower than going to an Auction House - We will beat any written estimate. - depending on the assignment. Please call to discuss. READY TO PLACE YOUR APPRAISAL REQUEST. ORDER NOW ONLINE THRU PayPal. What is the intended use of the appraisal? What is the location and items involved? What is the level of documentation require? Gather documentation, sales receipts, certificates, past appraisals, letters, and any other information you might have. Prepare for the appraisal: have items ready, unlocked and available especially jewelry, separate silver, stems and china; and if possible, pull furniture away from the wall. CONFIDENTIALITY : All information pertaining to the Appraisal is confidential, per USPAP standards. Access to the report will be granted only with written permission from the client, or by court order. All Appraisals are in compliance with the standards and ethics as set forth in only Creditable Appraisal Associations.